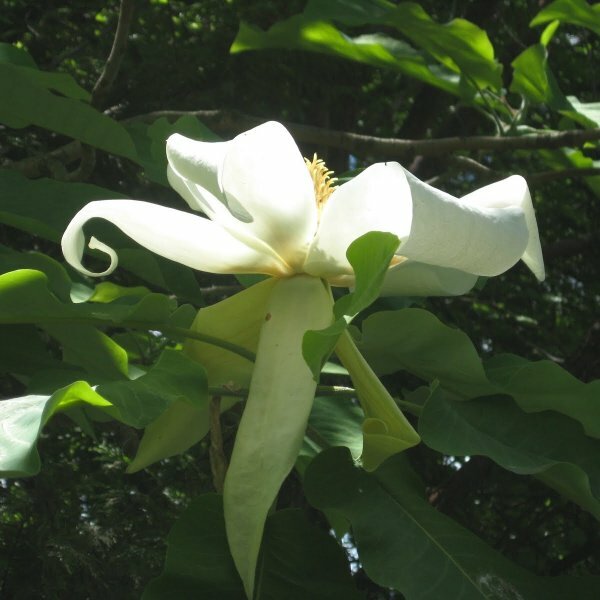 One of America's showiest native trees, bigleaf magnolia has large foliage with silvery undersides and massive, white, fragrant flowers in early summer. 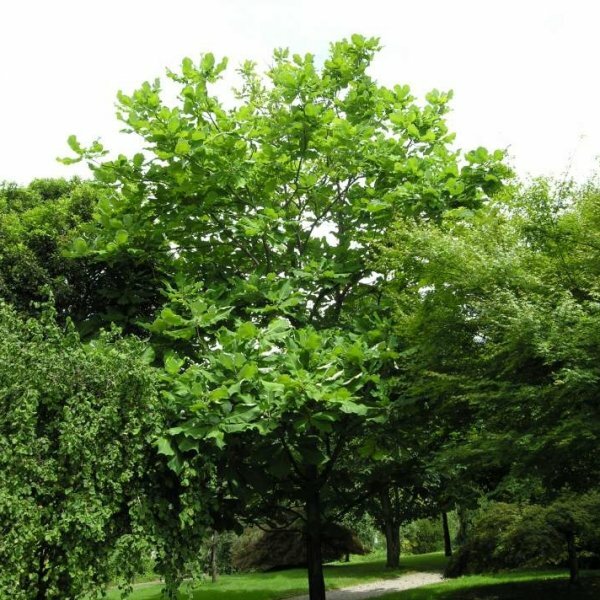 A deciduous tree, it slowly becomes broadly rounded with upright branches. Bigleaf magnolia is is native from the Ohio River Valley south to Louisiana and Florida. Its smooth bark is tan to sandy brown. In early spring the fuzzy, bluish green leaf buds swell, unfurling to form huge, egg-shaped leaves of bright green with silvery gray undersides. These thin papery leaves become dark green by summer's start and readily flutter in the wind. 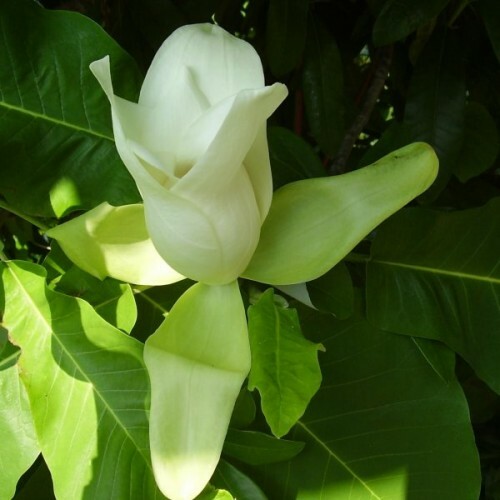 After leaf-out, the stem tips will bear large, dinner-plate or larger flowers that are white and fragrant. 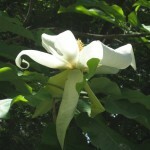 The innermost petals have maroon markings. Pollinated by bees and wind, the firm, upright fruit will eventually split open to reveal the rosy seeds. Fall foliage color is yellow-green and tan, with the massive, dried leaves creating an amazing carpet across the ground. 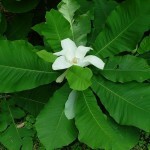 Site a largeleaf magnolia in full sun to light shade--in hot-summer climates--in a spacious garden location. Soil must be non-alkaline and moist, deep and rich in organic matter for best growth, which is always relatively slow. 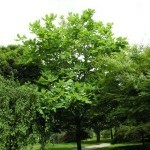 Use it as a magnificent shade and specimen tree on a spacious park or campus lawn. This tree is prettiest if not crowded by other trees or buildings. Germination 1. Soak the seeds in water to soften the coating. Change the water every day 3 or 4 times. Use your fingers or rub between paper towels to wash the coating off. 2. Stratify the seeds in the refrigerator at +2-+4C for 30-40 days in a damp medium (steriule sand, peat moss or damp paper towels) in a plastic tub or bag and then bring them out into room temperature. Or plant them outside. 3. Once sprouted the young seedlings/trees need protection for the first couple of years from weather extremes and critters. If you're planting outside, wait until after winter.